Is Riley County a High Radon Area? Simply put, yes, it is. Riley County and Manhattan are in the Environmental Protection Agency’s (EPA) Zone 1, the highest risk zone. We will quickly summarize the basics of what Radon is and how it is measured to help make sense of the levels in Riley County. Radon is an element, a colorless and odorless radioactive gas that may be accumulating in your home or business. For a more detailed answer check out our What is Radon article. Radon is measured in picocuries per liter (pCi/l). Keeping it simple, a curie is a measurement of radioactivity and a picocurie is one trillionth of a curie. On the most basic level curies and picocuries are a measure of how many radioactive decays occur, or how many times radiation is emitted, per second. For a more detailed answer check out our Understanding Radon & Radiation article. What Does it Mean that Riley County is in the Highest Risk Zone? Zone 3: Counties with predicted average indoor radon screening levels less than 2 pCi/l. It is important to note that the EPA and Surgeon General recommend all homes below the third floor of a building be tested for Radon regardless of the zone they are in because high radon has been found in every zone. Your county’s zone does not tell you whether you have high radon. Neighbors might have very different radon levels. (For more detailed information on what causes high radon check out our What Causes High Radon article) Also, as noted just above, the EPA discourages using the zone ratings to decide whether to test because they recommend every home is tested. That said, it is understandable that the data effects our perception of risk, and therefore also, our likelihood to perform a test. Essentially, because Riley County is in Zone 1, the EPA predicts the average radon levels in the county are above 4 pCi/l. The Kansas Department of Health and Environment (KDHE) has published more detailed data including a radon zone rating for all zip codes in Kansas. 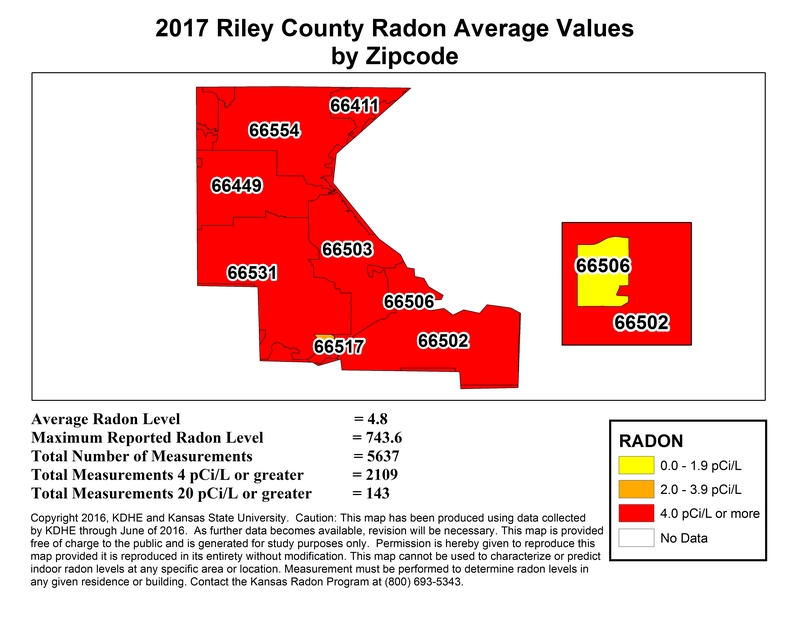 Nine of ten ZIP codes in Riley County had HIGH average Radon and over 51% of Riley County homes tested had HIGH Radon. Why does that matter? Is Radon actually Dangerous? Yes, Radon is dangerous. Long term exposure to elevated radon increases your chance of getting lung cancer. Even among cancers, lung cancer is a bad diagnosis. Cancer Research UK found that lung cancer has the lowest survival rates of the ten most common cancers (possible exception pancreatic cancer). The EPA estimates that over ​21000 people die each year from lung cancer caused by radon exposure. Not from smoking...from radon exposure. That is over 50 people every day. For a more detailed answer check out our Health Risks of Radon Exposure article. How can I get my home tested? Radon tests are divided into either short-term tests or long-term tests and conducted with a radon test kit or with a continuous radon monitor. Radon levels naturally fluctuate over the course of a day. For that reason, the EPA recommends testing for no less than 48 hours. Short-term tests range from 2-7 days in duration whereas long-term tests range from 3 months to a year in duration. Due to daily and seasonal fluctuations of the radon levels in your home the ideal test is a 1-year test. This would factor in all fluctuations over each season of the year. Whether you are getting a test for a real estate transaction or just out of concern for your safety, waiting a year to get your results is likely not an attractive option. For this reason, most people opt to get a short-term test. The EPA has specific recommendations for how to follow up on test results based on the levels returned by the test. Get an affordable short-term test from Amazon or the local hardware store for about $15. Check with the local extension office whether they have kits you can purchase at a discount for about $10. Request the same kit used by the Kansas Radon Program from us for FREE. Call us or another local radon testing company about getting a test with a continuous radon monitor. Get an affordable long-term test from Amazon or from the local hardware store for around $25. You can read our more detailed article on Interpreting Radon Test Results, or simply give us a call. Regardless of what test you used, we would be glad to talk to you about your results and answer your questions. Are you looking for information on Radon Mitigation? Click here to learn more about our radon mitigation services or give us a call.